Protector for multi-brand jackets, such as: Spyke, Acerbis, Out and Axo. 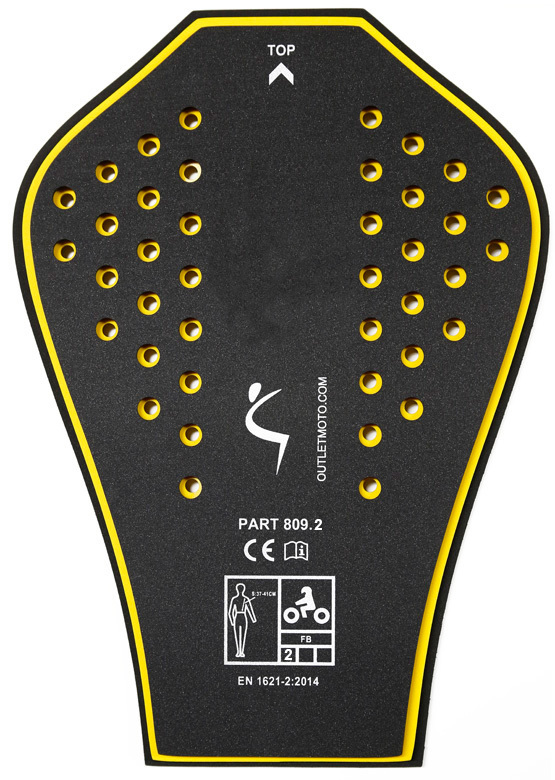 The back protector 809-2 CE-level 2 is designed to absorb impacts. Nitrile rubber and Polinorbornene construction. This flexible material is known as Memory Foam. In case of impact the force is distributed between the different layers (three layers) of the protector reducing to its maximum the energy transmitted to the back. At the same time, thanks to its flexibility, it is much more comfortable than any other conventional backrest. The difference between Level 1 and Level 2 are the number of layers, Level 2 with four layers is less flexible because of its thickness. Certified EN 1621-2: 2014 - Level 2. Size XS - 32 cm long x 23 cm. wide. Size S - 37 cm. long x 26 cm. wide. Size M - 41 cm. long x 29 cm. wide. Available OUT Back Protector NEW Level 1.